What I love about PeeGee hydrangeas is that they continue to look beautiful even as the flowers turn color and fade. These are turning a deep rose shade and the shrub is just as lovely as when the flowers were blazing white. 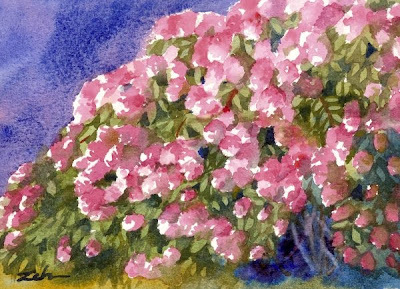 I often see this particular shrub when sitting at one of the two stop lights we have in my town and always want to do a painting of it. Last time I was there, I grabbed my camera and stuck it out the window to get a reference photo. Not the greatest photo - the painting came out much better! This painting has been sold. See my website, zehoriginalart.com to see my art currently for sale. Thanks for stopping by. I hope you have a wonderful day!